Get social at our upcoming holiday mixer! 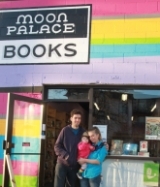 A social, a merchandising workshop, a gift guide, and a busy Saturday on Lake Street. 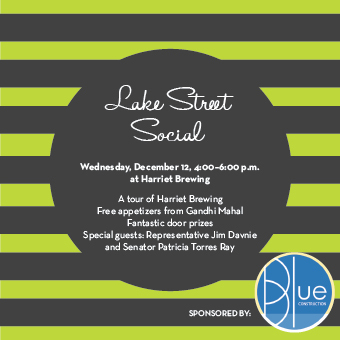 Join us on at Harriet Brewing's Tap Room on Wednesday, December 12 from 4:00 to 6:00 to celebrate and network with the Lake Street community! Black Friday, Small Business Saturday, and Cyber Monday have come and gone, but you and I both know you're not done holiday shopping. Lucky for you, we've got a selection of gift ideas you can find on Lake Street on our 2012 Holiday Gift Guide. Join us on Tuesday, December 4 from 3:00 to 5:00 p.m. for a FREE merchandising workshop. The workshop will take place in Kitchen in the Market's meeting space at the Midtown Global Market (920 East Lake Street) and will be led by by Brent Meyers, Director of Minnesota College of Art and Design DesignWorks. We will sit down to discuss creative merchandising tactics before walking the Market, rearranging and improving vendors’ displays with an eye for presentation and sales. This event is FREE and open to all area business owners and employees. RSVP: Tickets are limited. Sign up here! December 1, 10:00 a.m.–2:00 p.m.
December 1, 11:00 a.m.–3:00 p.m.
January’s Breakfast with Gary will feature the 10th Annual State of the Ward Address and Ninth Ward Awards. Awards will be given for Leader of the Year, Block Club of the Year, Neighborhood Project of the Year, and Youth Leader of the Year. Please submit your Ninth Ward Award nominations to Council Member Gary Schiff by Friday, January 11. We've got stuff you can buy. Are you in the market for a Nice Ride season subscriptions? Tickets to the Minnesota Opera? Dance classes? 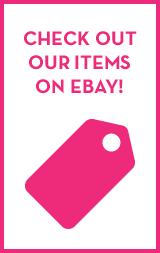 We've got all that and more listed on eBay right now. Treat yo'self at a discount and help benefit Lake Street Council along the way. Win/win/win. Now open: World Street Kitchen. The brick-and-mortar store of the popular food truck is serving up international street food seven days a week. Comedy Suitcase brings new meaning to "Secret Santa"
After a couple of successful runs with The Harty Boys Save Christmas, the folks at Comedy Suitcase change things up a bit this year with a new show from local playwright Tim Uren titled Christmas: Impossible. After leaving Town Talk Diner, Nick Kosevich founded Bittercube Bitters with Ira Koplowitz. In addition to running the bitters company, the two are now consulting partners and head bartenders at Eat Street Social. When the Walker Church building—community hub, activist meeting space, and home of a more than 125-year history—burned down on May 27, it had 180 days to turn in plans for a re-build in order to keep its zoning. Carrie Johnson talks about her culinary history, the weirdest food she's ever eaten, who would play her in a movie, and what's next for Nightingale. Longfellow Grill’s new patio space should open it in early March. The early open is possible with newly-installed gas heaters that are designed to make a 25 degree day feel like 60. Copyright © 2012 Lake Street Council, All rights reserved.